A friend of mine shared a video that was a latte, but it's not a regular latte art but 3D latte art. I searched where the drink was served and figured out it's at Reissue, a cafe in Harajuku. They don't take reservations so that my husband and I went there around 1 PM today, the last day of 3-day weekend, but they're full. There're empty tables but they said it's "reserved," and what they meant was they were for those who came in and put the name and phone number to a waiting list. They said the wait would be about an hour so that we told our name and gave my phone number, then headed to Gion Tokuya to kill time. However, they called us in about 20 minutes so that we quickly finished the food and ran to the cafe. According to "How to Latteart," I could request the art that I'd like to get and I showed the video that I saw, then a staff took a photo of it to place an order in the kitchen. Wall of the cafe was filled with cards. Photos of latte art that had many domestic and foreign characters. They had an album, too. 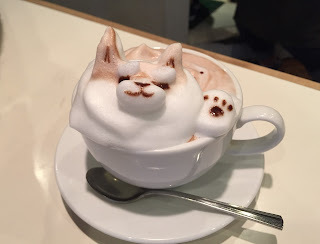 The items listed in Hot Drink with red star mark (⭐︎) can be ordered with a design you'd like for 400 yen more, and I got hot chocolate with 3D Shiba Inu. * Inu (犬) is dog in Japanese. In about 15 minutes, my Shiba Inu Hot Chocolate was served. On the left side of face, there's a front paw and on the back, there's a mini tail. The form was fluffy and airy, and once I put it in my mouth, it melted away smoothly with subtle bubbles. 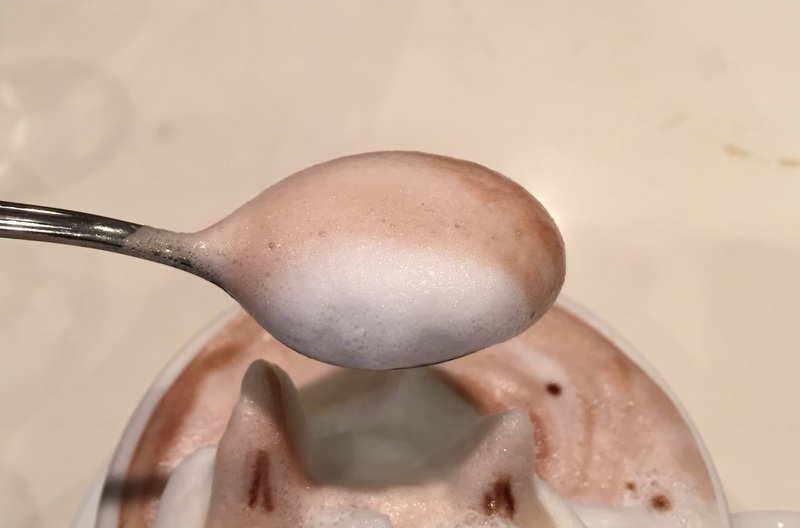 Pow on a tea spoon. 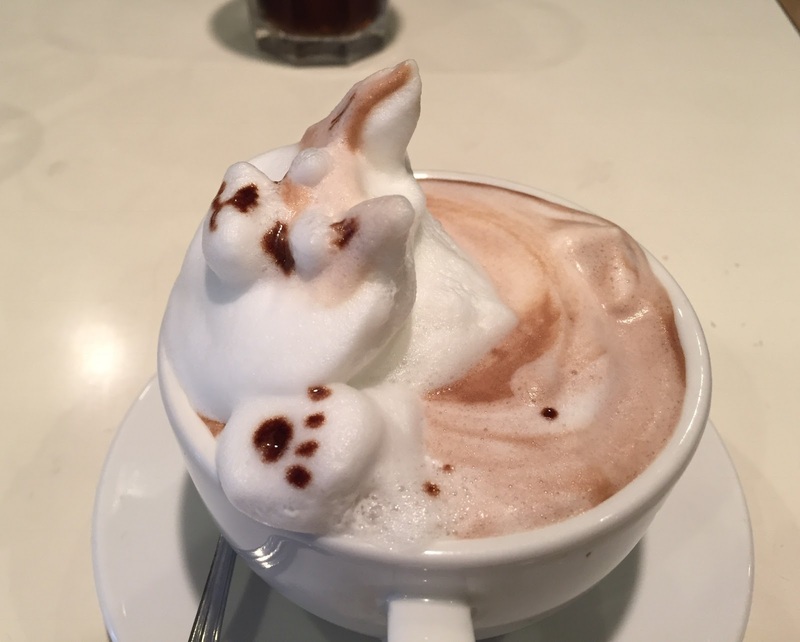 It's too cute to destroy the dog, I carefully had a sip. 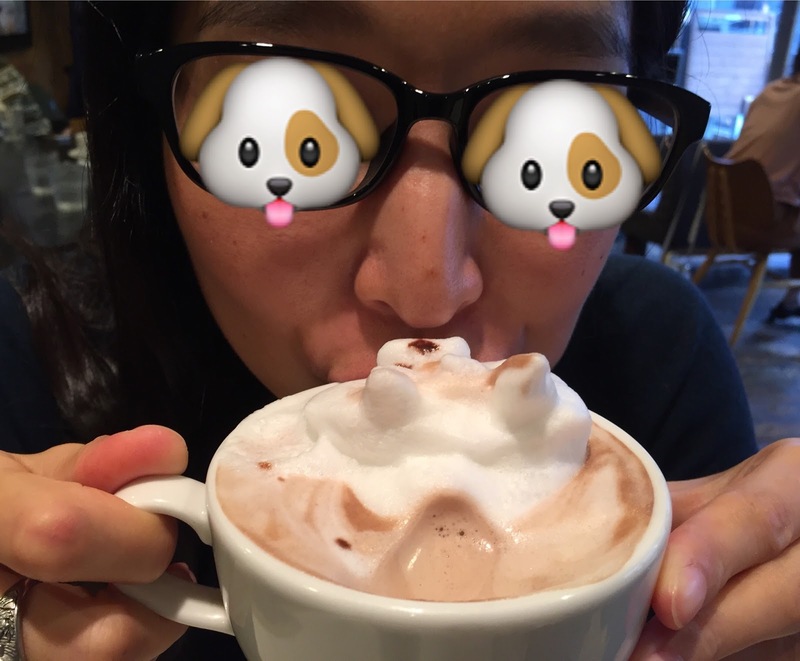 My husband said I looked like kissing a dog. 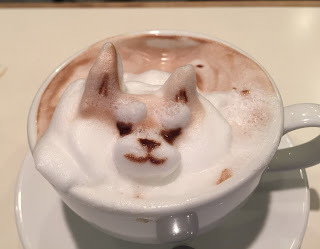 When I sipped it from the face side, the Shiba Inu got shrunk and had a sulky face. 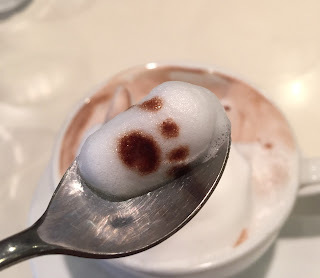 The hot chocolate had some sweetness and it's quite good. 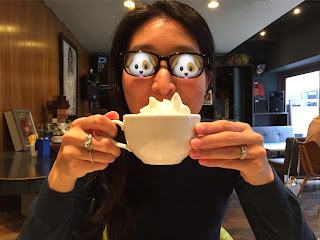 When I offered to my husband, he bit into the face and the Shiba Inu was completely gone, then I in the end mixed the form into the hot chocolate. It wasn't only adorable but also tasty, and I'd like to go back again.